If you have type-2 diabetes mellitus (adult-onset diabetes or non-insulin-dependent diabetes) Jardiance 10mg may help to control your blood sugar levels. It can be taken by adults with type-2 diabetes mellitus (adult-onset diabetes or non-insulin-dependent diabetes). It contains the active ingredient Empagliflozin. Jardiance 10mg is a strip of 10 tablets. This is the dosage most often used as a starting dose. Jardiance is also available as a 25mg tablet. Jardiance 25mg is diabetes medicine that can help to control blood sugar levels in adults with type-2 diabetes mellitus (also called adult-onset diabetes or non insulin-dependent diabetes). 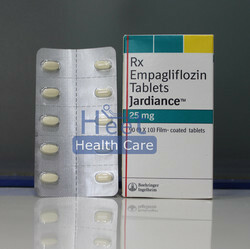 Jardiance contains the active ingredient Empagliflozin, a drug of the gliflozin class. Jardiance 25mg is a strip of 10 tablets. Most people start with a dosage of 10mg, but can increase to 25mg if needed. Packaging Details: 9 strip in one box. 10 tablets per strip.